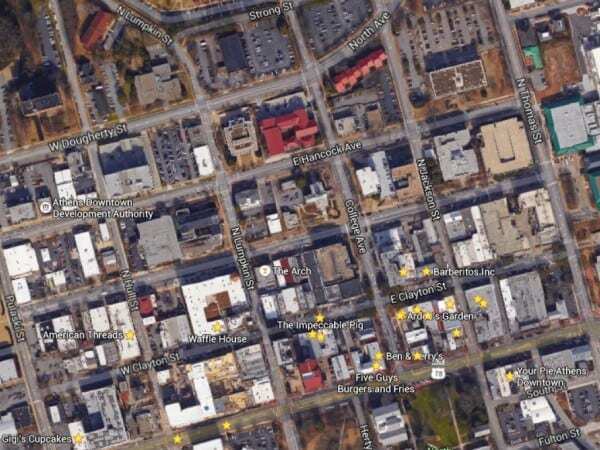 Yellow stars on this map of downtown Athens indicate a current or proposed franchise or chain business. When J. Crew Mercantile opens its doors for business Wednesday on Broad Street, more than 20 national or statewide chains will be located in downtown, which has been traditionally made up of local businesses. Three years ago, only 12 of these existing businesses were in downtown. Five years ago, only nine were present, and 10 years ago, only six were in business. Chuck Moore, Athens-Clarke County financial services administrator, said a business can receive a permit in downtown Athens as long as it meets all of the required ordinances. It does not matter if it is locally owned or a chain, Moore said. Zaxby’s and CVS Pharmacy are also scheduled to soon join this mix. More than 65 specialty retailers, 55 eateries and 40 taverns and nightspots are located downtown, according to the Athens Downtown Development Authority website. Snow on the roads? No problem.